It's Comic-Con week, which means we're going to be hit with new toy reveals from all angles. That's why only a day after Hot Toys took the wraps off a life-like Christian Bale figure, the Hong Kong company has shown off a Gary Oldman piece that's even cooler. Why? Because it's Gary Oldman. 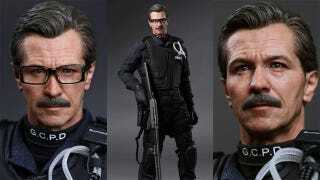 And his Jim Gordon character has been recreated here so perfectly that you can count his moustache hairs, wrinkles and skin pores. Not that you'd ever want to do that...hold Gary Oldman in your hands and just...oh, are you guys still here? If you are, he'll stand around 12" tall, and should cost around $200. Expect more info from Comic-Con.